After rebounding from the upper target levels, the EUR/USD currency pair started falling down. The first target for the bears is at the level of 38.2%. The stop on my sell order is already in the black. 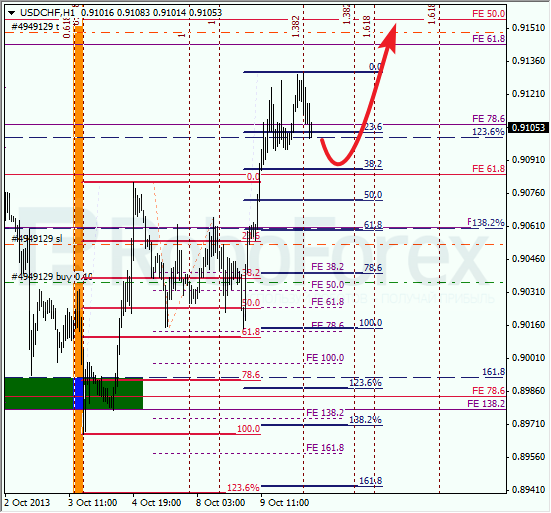 At the H1 chart, a local correction is taking place. If the price rebounds from the level of 38.2%, the pair will start a new descending movement. The market may break a local minimum during the next several hours. Franc rebounded from the lower target area. The price got very close to the intermediate target, which is at the level of 38.2%. If later the pair rebounds from it, the price may start a correction. At the H1 chart, the bears started a short correction. We can’t exclude a possibility that the pair may test the level of 38.2% during the day. In the market rebounds from this level, the bulls will start a new ascending movement and break the maximum.